Parish visits and a special encounter with a monastic writer and abbot, plus great travel weather, have ‘put the wind in my sails’ for this major leg of my American Thebaid Pilgrimage. Sorry for the spotty posting lately, but my limited multitasking capabilities have been limited to a variety of deadline-driven tasks. Now that I’m actually on the road towards my next monastery destination, I wanted to take a moment and share with you some recent experiences. Fr Damascene of Platina and Fr Gregory Schultz of St Michael the Archangel (Serbian Archdiocese), celebrate Vespers during the annual Parish Retreat in Huntsville AL, June 1. After leaving Birmingham AL on Thursday last (May 31), I headed ‘just up the road’ to Huntsville, where Fr Damascene, abbot of St Herman of Alaska Monastery in Platina CA, was giving a series of talks for the annual parish retreat of St Michael the Archangel (Serbian Archdiocese – English language). 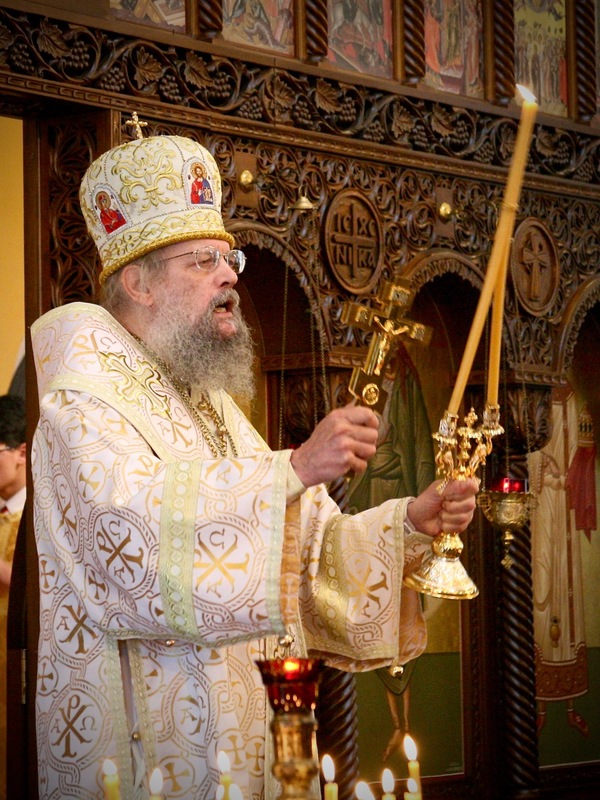 St Herman’s was, as most of you know, co-founded in the late 1960s by Fr Seraphim Rose of Blessed Memory (†1982) and Abbot Herman (Podmoshensky), who reposed just a couple of years ago. 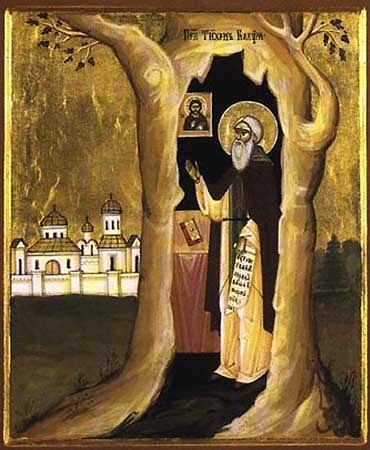 Fr Damascene was one of the last spiritual sons of Fr Seraphim Rose, and is the author or editor of three remarkable and essential books: Father Seraphim Rose: His Life and Works, Christ the Eternal Tao, and Genesis, Creation and Early Man – The Orthodox Christian Vision (by Fr Seraphim Rose, edited by Fr Damascene). This retreat was a wonderful experience, both for Fr Damascene’s talks on Creation, Salvation, and Deification (deeply immersed in the words of the Holy Fathers of the Church), and for the experience of camping out at Monte Sano State Park with the St Michael’s parish community. I hope you can join me for the St Symeon Food & Culture Fair for a special day of events, presentations, beautiful chorale music, food, exhibits, church tours, and much more. 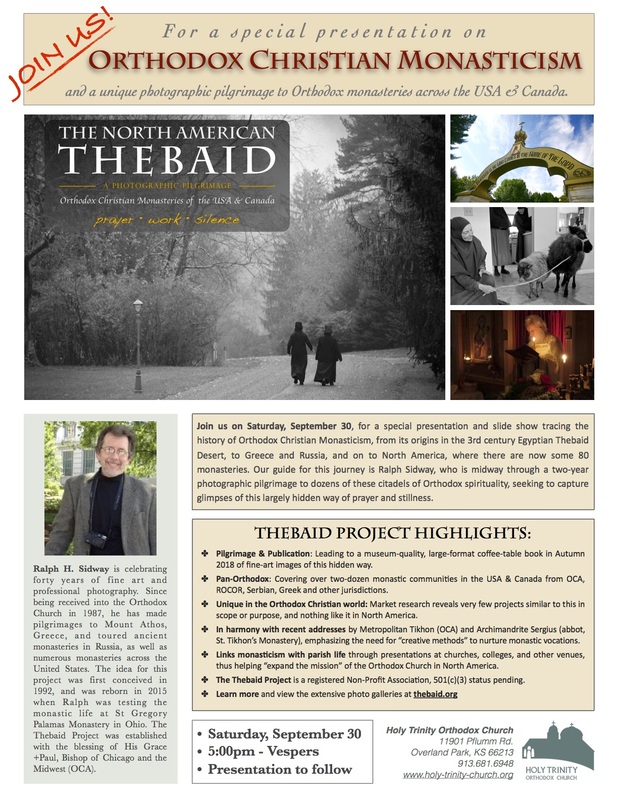 I will be giving an introductory presentation on Orthodox Christian Monasticism throughout the day, featuring photographs from over a dozen monasteries in North America from my book project, The North American Thebaid. My heartfelt thanks to Hieromonk Cyprian (DuRant, rector) and the parish of St Mary of Egypt Orthodox Church (OCA), in Norcross GA, for hosting me this past Sunday. The Divine Liturgy was beautiful in this handsome wood-timbered church, itself reminiscent of churches in the Russian north. In spite of the epic snowfall two days before, the church was nearly full, a testimony to this vibrant parish. I gave my presentation during the fellowship meal in the church hall, where I quickly discovered many of the parishioners have strong ties and make pilgrimages to several monasteries in the region. I am truly grateful to Fr Cyprian for his gracious invitation, Reader Thomas for organizing the event, and to all the faithful, who helped refill the Thebaid Project gas tank with a generous collection. If you’re ever in the Greater Atlanta area, be sure to search out this parish, a strong and inspiring example of Orthodoxy thriving in the midst of (and in spite of!) our post-modern and post-Christian world. I look forward to scheduling a return visit, with the express purpose of making some photographs for the parish in thanks for their support of the Thebaid Project. Learn more about hosting a Thebaid presentation for your parish here. I am determined to get caught up on posting photographs I’ve made at the wonderful parishes which have hosted my presentation on Orthodox monasticism and helped support the Thebaid Project. My heartfelt thanks to Fr Basil Rusen and the parish of St Herman of Alaska in Hudson OH, for their friendship, generosity and prayers! If you are in the area, I urge you to visit this thriving mission parish! I was honored to be invited by Fr Timothy Sawchak to give my presentation on Orthodox Monasticism and the North American Thebaid on September 30. Holy Trinity is celebrating their Centennial this year, and it was very special to me to be able to honor this milestone by making some photos for them. UPDATED WITH ADDITIONAL PHOTOGRAPHS FROM THE 40TH PARISH ANNIVERSARY THIS OCTOBER, AND THE NEW CHURCH GROUNDBREAKING FROM JUNE 2013! I’ve been visiting St Symeon the New Theologian for thirty years, soon after the parish moved to its current location in Birmingham. 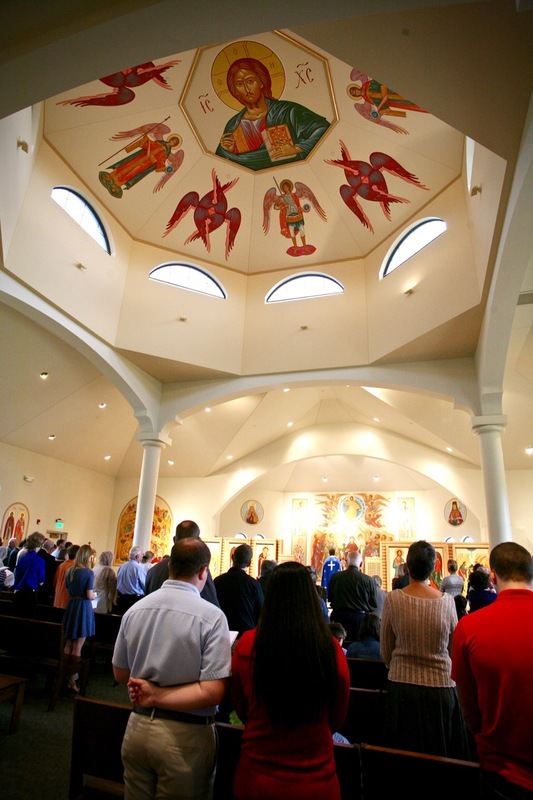 In recent years I have photographed the groundbreaking for their new church building, their unique collection of hand-painted icons, and group photos and divine services surrounding the 40th anniversary celebration of the parish. Learn more about St Symeon’s at their website. 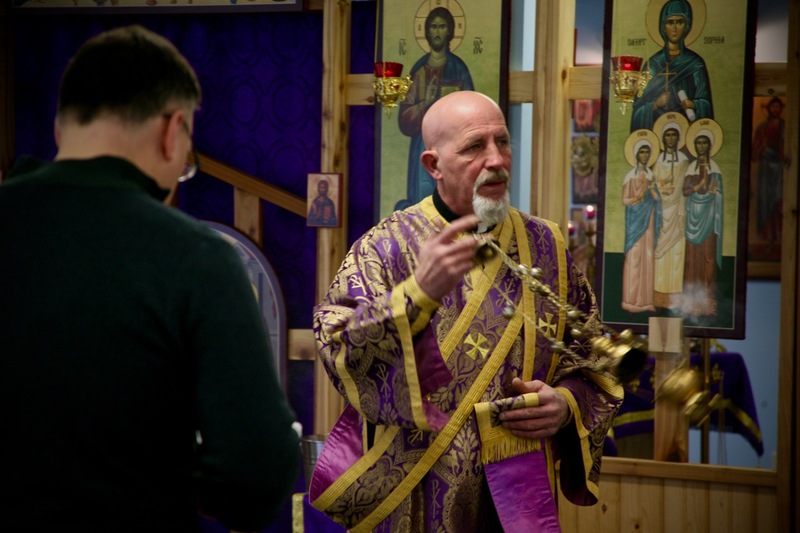 This selection of images conveys the feel of the festive Hierarchical Divine Liturgy for the 40th Anniversary of the parish. A mix of wide, overall views, with closeup images, seeks to tell the story of this landmark event. 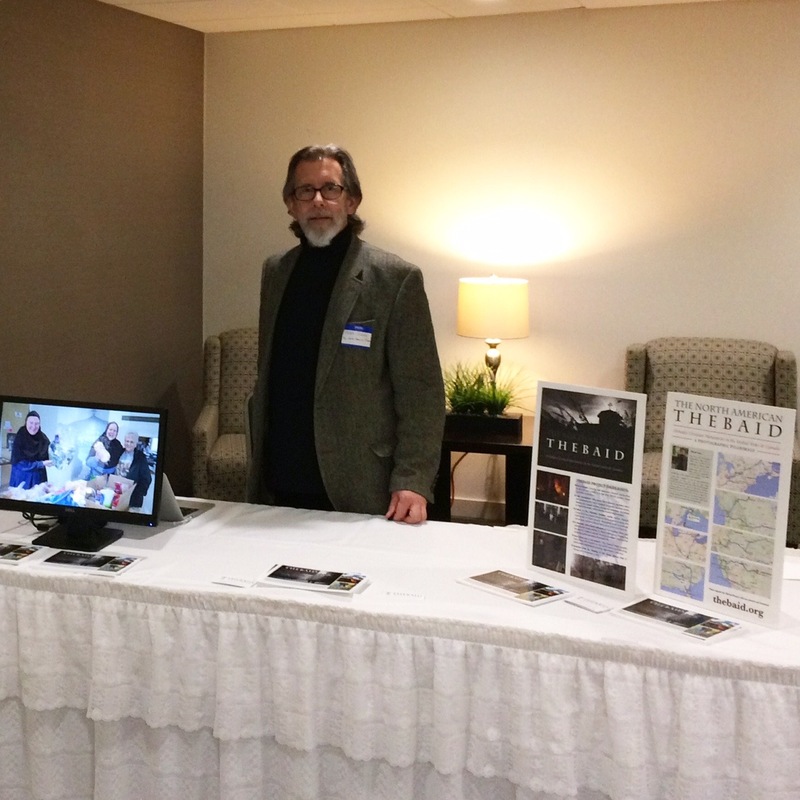 Yesterday, October 12, I was at the OCA Diocese of the Midwest Assembly at St Michael’s Orthodox Church in Broadview Heights, south of Cleveland, where I set up my full Thebaid display, and was able to meet and discuss the project with numerous clergy and lay representatives from several states. Thebaid Project display at the OCA Midwest Diocese Assembly. I have found that when I meet people and describe the Thebaid Project in person, there is a much more vivid grasp of the inspiration and purpose of the project, and a corresponding affirmation of it. I arrived during the morning registration check-in and breakfast, and had great conversations through the entire day. The weekend of September 16-17 found me at St Mary of Egypt Orthodox Church (ROCOR) in Roswell GA, where I had been invited by Fr John Townsend to give my presentation on the History of Orthodox Monasticism, and the North American Thebaid Project. 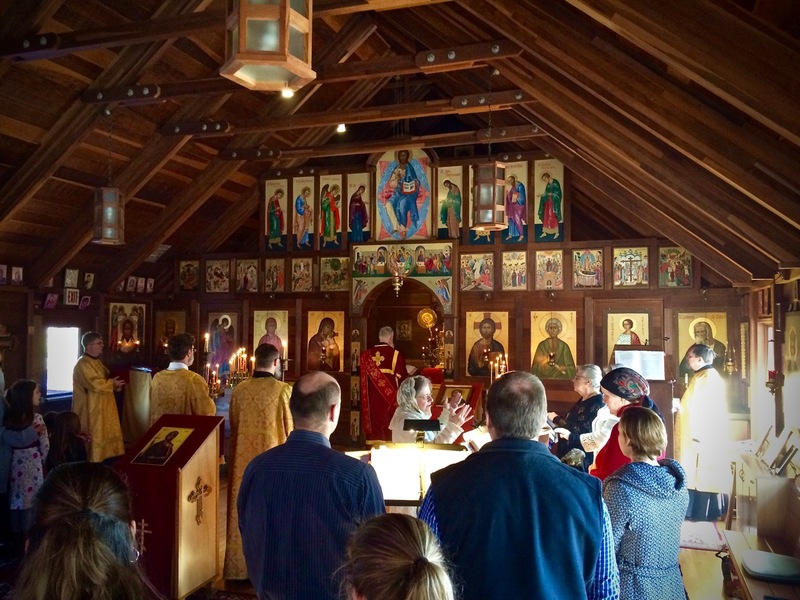 The warm hospitality of the entire parish, the beauty of the church and iconography, and the vivid sense of the nearness of the heavenly kingdom and the saints (especially accentuated by the two reliquaries flanking the nave) embraces one upon entering, and made my experience of Saturday’s Vigil and Sunday’s Divine Liturgy quite lofty and edifying. As I typically do when visiting parishes, I made some photographs during the Liturgy to gift St Mary’s as a “Thank You”, and wanted to share a few highlights with you. My heartfelt thanks and appreciation to Fr John and the parish, and I look forward to return visits in God’s timing. If you are interested in scheduling me for a parish presentation, I’d love to make that happen! Please contact me at [zosimas at thebaid dot org], and also check out this page which may answer many of your questions. Technically, I’ll be in Kansas for this one! 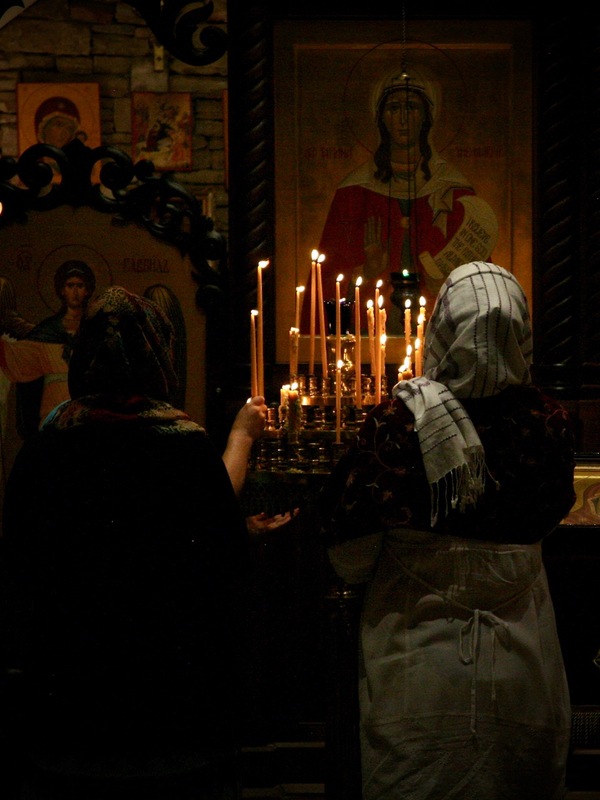 — If you are in the greater Kansas City area, please join us at Holy Trinity Orthodox Church in Overland Park, Kansas, on September 30, for my presentation on Orthodox Monasticism and the North American Thebaid. I’ll also be at coffee hour following the Divine Liturgy on Sunday, October 1, with my Thebaid Project display, including handouts and a continuous digital slide show, and hope to see you there. Holy Trinity is celebrating their Centennial Anniversary this year (and in fact are holding their official celebration and banquet the following week), and I am deeply honored to be speaking here. 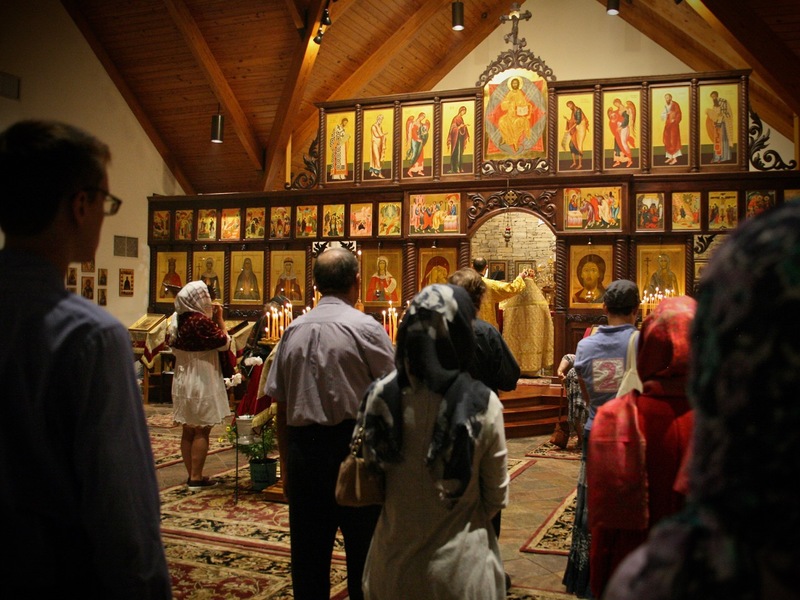 Join us at St Mary of Egypt Orthodox Church (ROCOR) in Roswell GA (north of Atlanta) tomorrow, Sunday, September 17! 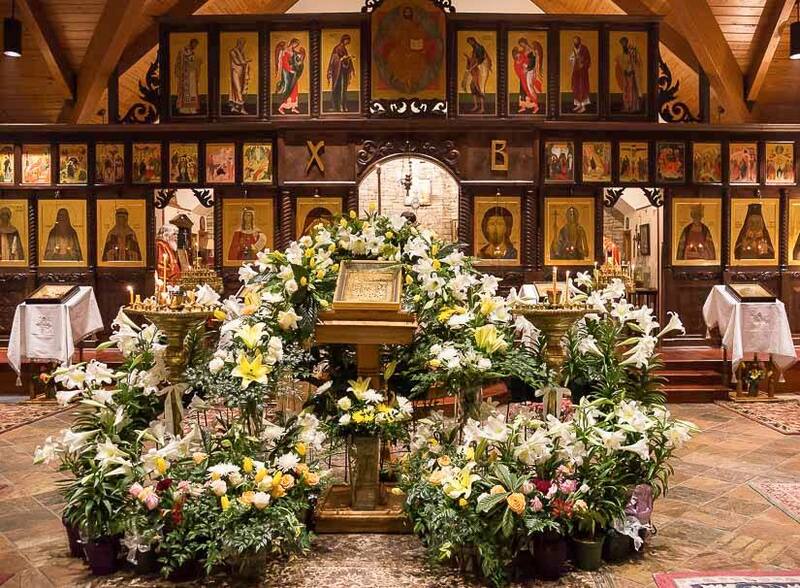 St. Mary of Egypt Church, Pascha 2017 (photo from parish website). and then my presentation on Orthodox Monasticism and the North American Thebaid. My heartfelt thanks to Fr. John Townshend for inviting me.